Ice Boot to Blade Sizing Chart and Mounting Information – Skates U.S. 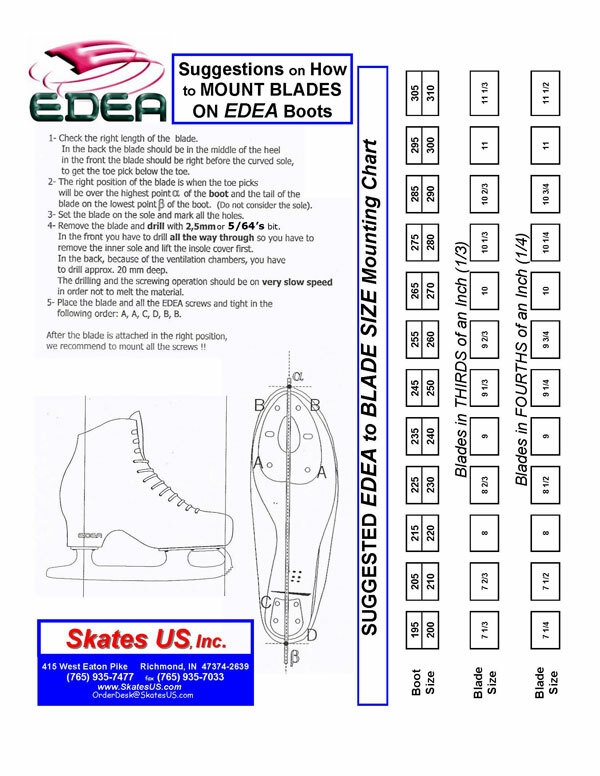 The ICE Boot to Blade Sizing Chart is Very consistent for the EDEA Skates. The footbed of the EDEA Skates are extremely consistent and this chart works very well. The EDEA Skates DO MOUNT to the Blades differently than just putting screws into the sole. PLEASE read the instructions and please use the special EDEA screws. If you do, the mount will be great. The bottom surface of the EDEA Skates is a special waterproof material. Once mounted (if no additional holes are left open), NO ADDITIONAL Waterproofing will be necessary, in most cases.